Where can I find NSF funding opportunities? The NSF lists its funding opportunities by deadline here. You can perform a keyword search here. Consider subscribing to NSF updates and announcements to receive customized information about various funding opportunities. When filling out the cover sheet, what is the correct information for the Awardee Organization and Primary Place of Performance? It is important that this information is correct on your Cover Sheet. If you grant SRO access but your contracting officer cannot see your proposal, check this section first. Incorrect information here often prevents OSP from seeing proposals in Fastlane. What is Georgia Tech's PI Eligibility Policy? The Research Administration Policies & Procedures for PI/PD Eligibility (2.1.1) can be found at http://policy.research.gatech.edu. What are the salary policies for senior personnel listed on my proposal? Senior personnel are generally co-PIs (and faculty associates) who are responsible for the scientific and/or technical direction of the project. If your proposal has more than one senior personnel, the first one listed will have the primary responsibility for the project and submission of reports. Two policies govern senior personnel on NSF awards. As a general policy, NSF limits salary compensation for senior project personnel to no more than 2 months of their regular salary in any one year. This limit includes salary compensation from all NSF-funded grants. During the life of the award, it is the PI's responsibility to obtain sponsor prior approval for absences (generally 3 months or more) or significant reductions (25 percent or more) of the PIs and/or other senior personnel. What is the Minimum Effort Policy? At least one Senior Personnel must devote at least 1 percent effort each budget period over the term of the award. The Research Administration Policies & Procedures for Minimum Effort (2.1.6) can be found at http://policy.research.gatech.edu. .
Can I include cost-sharing on my NSF proposal? Inclusion of voluntary committed cost-sharing is prohibited, and Line M on the proposal budget will not be available. Mandatory cost-sharing will only be required for NSF programs when explicitly authorized by the NSF Director, the National Science Board, or legislation. For more information, see this list of NSF programs that require cost-sharing. In those rare instances, cost-sharing requirements will be clearly identified in the solicitation and must be included on Line M of the proposed budget. For purposes of budget preparation, the cumulative cost-sharing amount must be entered on Line M of the first year's budget. Should an award be made, the organization's cost-sharing commitment (as specified on the first year's approved budget) must be met prior to award expiration. Such cost-sharing will be an eligibility, rather than a review criterion. Proposers are advised not to exceed the mandatory cost sharing level or amount specified in the solicitation. What if I don't want to charge my 1 percent to the project? In the case that you do not wish to charge the minimum effort to the project, this effort is provided by way of internal cost-sharing that is not reported to the NSF. How do I determine whether I should budget an individual as a consultant/vendor or as a sub award? Does the entity's statement of work represent an intellectually significant portion of the programmatic decision making? Could the entity's work result in intellectual property? Does the entity have responsibility for programmatic decision making? Will the entity require animal and/or human subject approvals for its portion of the work? Does the entity commonly provide these goods and/or services as part of its normal business operations? Does the entity provide similar goods and/or services to other purchasers? Does the entity compete with comparable entities to provide the same goods and/or services? Are the goods and services being provided by the entity secondary to the central purpose of the project? Is the entity's work carried out according to the Prime's specifications using standard operating procedures? If a vendor relationship is required, remember that indirect costs (Facilities & Administrative) will need to be charged on the entire amount of the transaction. The services of each consultant must be justified within the context of the proposal. You must provide information regarding each consultant's expertise, organizational affiliation, and contribution to the project. In addition, each consultant (paid and unpaid) must provide a signed statement that confirms availability, time commitment, role in the project, and the agreed consulting rate. What is the Responsible Conduct of Research Policy and when does it apply? For more information on the RCR policy, see this list of Frequently Asked Questions. What if my proposal involves human subject research? Make sure that both the Fastlane cover sheet and the Georgia Tech routing form have the appropriate box checked for Human Subject Research. Institutional Review Board (IRB) review and protocol approval will have to be in place before an award can be issued or funds released. Complete the IRB application here. What if my proposal involves the use of vertebrate animals? Make sure that both the Fastlane cover sheet and the Georgia Tech routing form have the appropriate box checked for Vertebrate Animals. Remember, Institutional Animal Care and Use Committee (IACUC) review and protocol approval will have to be in place before an award can be issued or funds released. What if my proposal involves the use of recombinant DNA? Make sure that the Georgia Tech routing form has the appropriate box checked for Recombinant DNA. Institutional Biosafety Committee (IBC) review and protocol approval will have to be in place before an award can be issued or funds released. Complete the IBC application here. What if my proposal involves the use of biological or physical agents? Make sure that the Georgia Tech routing form has the appropriate box(es) checked for biological and/or physical agents. Your contracting officer will forward the routing sheet and your proposal to the Office of Environmental Health and Safety (EHS), and your lab may need to be inspected. Keep in mind that both principal investigators AND co-principal investigators must be approved by EHS to use the designated agents. Your contracting officer will not be able to release any NSF funds until the EHS approval is in place. What if my proposal involves the export of information and/or materials to another country? Make sure that the Georgia Tech routing form has the appropriate box checked off for Export Controls Review. The Georgia Tech Office of Legal Affairs will determine and obtain the necessary license(s) before any transfer of information and/or materials can take place. However, this review does not take place until an award has been made. If you receive an award that requires an export control review, please complete and return the Export Control Review PI/PD Certification for Sponsored Programs form(s) and return them with your statement of work as soon as possible. Understand that the funds cannot be released until the approval is in place. Do I need to route pre-proposals or letters of intent through OSP? 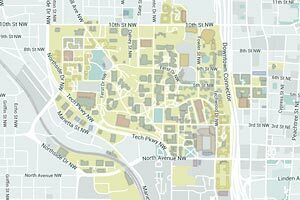 Pre-proposals and letters of intent do NOT need to be routed using OSP's e-Routing system. However, submission still takes place via NSF's Fastlane online web service and must be submitted by a Georgia Tech contracting officer. In the event that your pre-proposal is invited for a full proposal submission, please inform your contracting officer as soon as possible. How do I submit a proposal to the NSF? FastLane is the NSF online web service through which it communicates with researchers, reviewers, research administrators, and their organizations. All NSF proposals at Georgia Tech are submitted through Fastlane. We do NOT use Grants.gov or Cayuse for NSF proposals. How do I get access (NSF ID and password) to Fastlane? View our Research.Gov Registration Procedure Manual (PDF) for guidance on registering or managing your NSF ID. I have an NSF account/ID already but I cannot remember my password. What should I do? What happens when I allow SRO access? View – this level of access is sufficient to allow the contracting officer to review your proposal to check for completeness and compliance. If you grant this access, it is important that you return to provide Submit access when you are ready to submit the proposal. Edit – this level of access not only allows your contracting officer to review your proposal, but also to make any necessary administrative changes. Your contracting officer will not make any changes to your proposal without your permission. Again, if you grant this access, it will be important that you return to provide Submit access when you are ready to submit the proposal. Submit – this level of access allows your contracting officer to review your proposal, make any necessary administrative changes, and submit it. This level of access will also send notification to the OSP and is the only form of access in Fastlane that generates a notification for proposals. How should I submit a collaborative proposal when Georgia Tech is the lead? You will need to link the two proposals. Each university participating in the submission should provide you with their Temporary Proposal Number and their PIN. Within your proposal, you will select "Link Collaborative Proposals" and provide this information. As the lead university, you will be required to prepare and submit all the supporting documents. Be sure to check the solicitation for specific document requirements. How should I submit a collaborative proposal when another university is the lead? You will need to provide the lead university with your Temporary Proposal Number and the PIN. From your "Proposal Actions" page, you should highlight the proposal and select "PIN". As the non-lead university, you will only be required to prepare and submit the Collaborators and Other Affiliations (COA) Document, Cover Sheet, Biosketches, Budget/Justification, Current and Pending Support Forms, and Facilities, Equipment, and Other Resources. How will I know that my proposal has been successfully submitted? You should receive a notification from Fastlane after your contracting officer submits your proposal. You may also receive confirmation from your contracting officer. Additionally, you can also choose "View Submitted" from the "Proposal Preparation" screen. If a proposal number is not reflected in the FastLane System, contact the FastLane Help Desk at (800) 673-6188 or by e-mail at fastlane@nsf.gov. Can I make changes to my proposal after I submit it? How long should I wait to hear back about my proposal? You should allow up to six months for NSF review and processing. In addition, be aware that the NSF Division of Grants and Agreements generally makes awards to academic institutions within 30 days after the program division/office makes its recommendation. Grants made to organizations that have not received an NSF award within the preceding five years, or involving special situations (such as coordination with another Federal agency or a private funding source), cooperative agreements, and other unusual arrangements may require additional review and processing time. Proposals that are time-sensitive (e.g., conference, group travel, and research involving ephemeral phenomena) will be accepted for review only if, in the opinion of the cognizant Program Officer, they are received in sufficient time to permit appropriate NSF review and processing to support an award in advance of the activity to be supported. Every effort is made to reach a decision and inform proposers promptly. Until an award is made, NSF is not responsible for any costs incurred by proposing organizations.